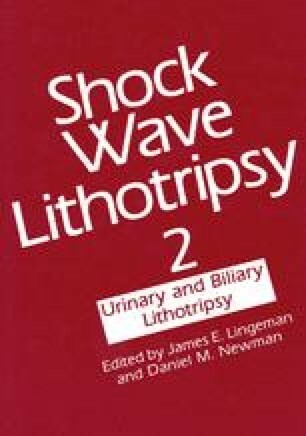 Hypertension has been reported as a possible result of extracorporeal shock wave lithotripsy (ESWL§). In order to evaluate this issue and also the risk of hypertension following other current treatment options for urolithiasis (percutaneous nephrostolithotomy [PCNL], combined PCNL and ESWL, ureteroscopy, and spontaneous stone passage), detailed blood pressure measurements were made in 961 patients who were treated at least one year previously. All blood pressures were measured with random zero devices, and all patients had their blood pressure taken three times during each visit, with each visit being at least one week apart. This study included 731 patients treated with ESWL only, 171 patients treated with ureteroscopy or spontaneous stone passage (controls), 25 patients receiving PCNL only, and 34 patients treated with both ESWL and PCNL. In patients receiving ESWL only, the incidence of hypertension varied between 2.4% and 7.4%, depending upon the definition of hypertension used. In patients receiving ESWL, no correlation was found between the incidence of hypertension and unilateral v bilateral treatments, the number of shock waves administered, kV, or power (number of shock waves times kV). Blood pressure changes were contrasted for ESWL of renal calculi and ESWL of ureteral calculi in situ. Patients with calculi treated in the kidney had significantly less change in their diastolic blood pressure than those with ureteral stones treated in situ (0.78 mmHg v 7.43 mmHg, P = 0.0003). When blood pressure changes in ESWL and control patients were compared, no significant difference was noted in the incidence of hypertension for any of the definitions of hypertension utilized. There was a significant rise in diastolic blood pressure following treatment with ESWL (0.78 mmHg, P < 0.0001) but not in the control group (-.88 mmHg, P = 0.308). The long-term significance of this change in diastolic blood pressure following ESWL is unknown and requires further study. Supported by grants from Cook Urological, Dornier Medical Systems, and the Methodist Hospital of Indiana, Department of Medical Research.